Once I thought about what I had inadvertently done, I stewed for days trying to decide whether I should write this particular blog post, admitting my mistake. I’m somewhat of a perfectionist. Something internal drives the compulsion that I should never make a mistake, including following rules that benefit us all. I know, that’s sounds a bit obsessive, but telling of the level of my concern. One of my favorite artistic devices is the tromp-l’oeil, which is a French word meaning fooling of the eye. My introduction to this device came when I was a child and visited the Philadelphia Museum of Art and gazed upon The Staircase Group by Charles Wilson Peale. As kids we always referred to it as the “painting with the step” and immediately knew the reference. Wooden colonial molding frames the painting; and an oak step, matching the color and textures of the painted steps, protrudes from the staircase at the bottom. 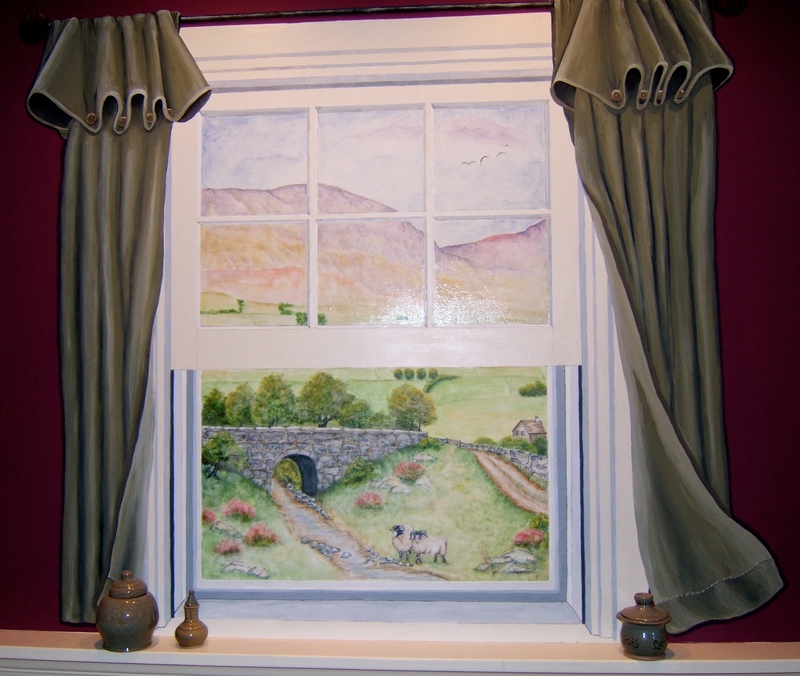 The painting must have made an impression as I’ve used trompe-l’oeil technique myself in some of my artwork. 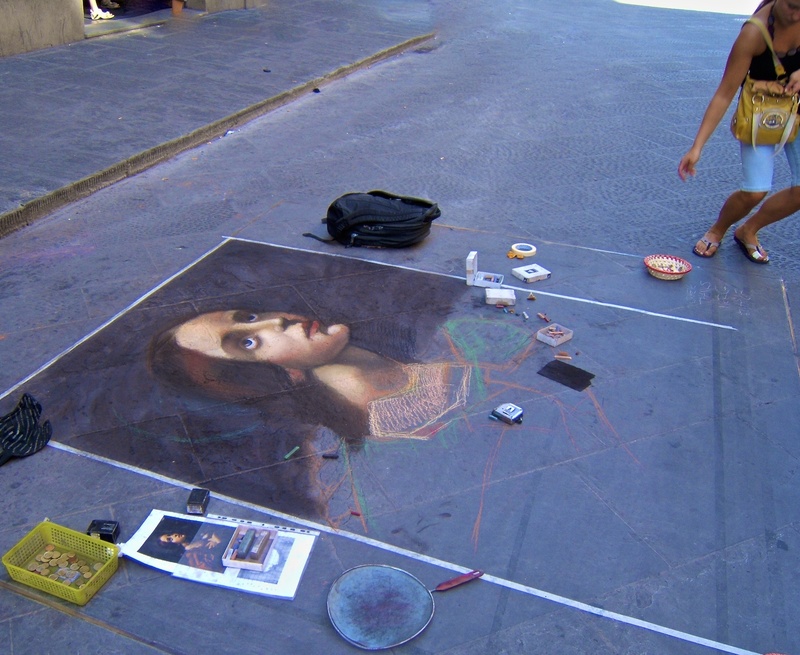 You may have seen this device used by artists, such as Julian Beever, whose anamorphic illusions are created by a distortion that enhances a three-dimensional effect. When I read over his web page, he wrote that he worked as a street busker in various busy thoroughfares throughout Europe, practicing his 2-D techniques using pastels on sidewalks. When visiting Venice in 2008, I took this photograph. Now I wonder if this art was his. In another example, Eric Johnson, a Swedish photographer, installed a 3-D photograph in one of the main squares in Stockholm with his Mind the Step creation, which is a perfect lead-in to my misstep at the museum. On New Year’s Day I returned to the art museum, accompanying the Philadelphia Chorus, to take photographs and videos of their holiday concert. 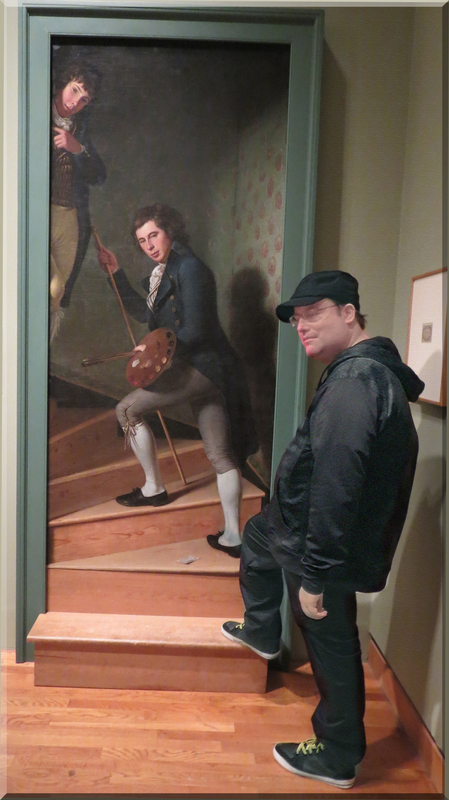 Between concerts, my son and I wandered through the galleries and came across the Staircase Group painting. Without thinking, I asked John to place his foot on the step with the idea that I would carry the illusion further in a photograph. Earlier I had asked a guard if the museum allowed non-flash photography, which is permitted. Ah, was I saved by the fact that the step was reconstructed? Given that the museum places ribbons across chairs to remind visitor not to sit in the displays, I asked myself why they didn’t place a reminder note at the the step. In the book, Citizen Spectator: Art, Illusion, and Visual Perception in Early National America, Wendy Bellion quotes a catalogue published in 1854 that recounted how viewers of the Staircase Group would place a foot on the first step. (p. 92). Well, that somewhat relieved my conscience that the urge to step was just about irresistible. One of the web pages of the Philadelphia Museum of Art states, “let your creativity soar” but from now on, I will watch my step. Meddling: Our Weakness or Strength? they should really go after those funny dressed fellows going up the stairs!! 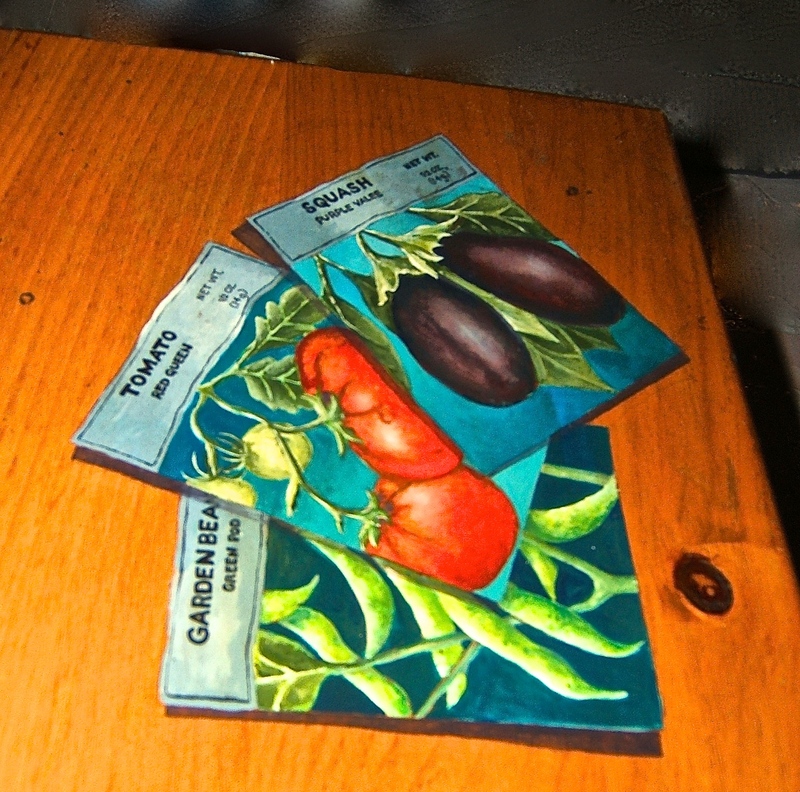 So much of art is serious, with tromp-l’oeil just can fun with it. I guess that’s what I like about it. Even though you shouldn’t have taken the picture, it is an awesome photo. The art engaged you so much that you and your son were pulled into the action. My son posted on his Facebook page, exposing the painting to a larger audience who had never seen it before. Peale probably would not have objected. Thanks for stopping by.